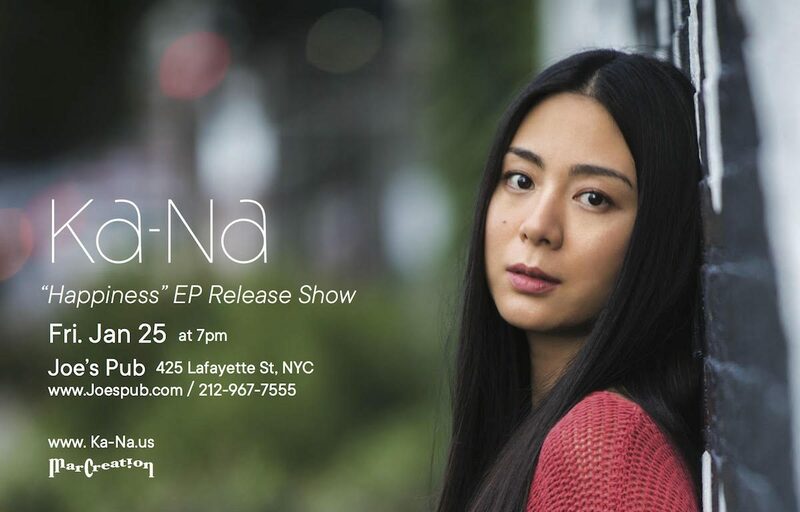 Friday, January 25 at 7:00 p.m.
J-Pop singer/songwriter Ka-Na (Kana Uemura) celebrates the release of her brand new, seven-song EP, Happiness, onstage at Joe’s Pub. She’ll perform with her own band for the first time in New York. Ka-Na is a gold record-selling singer, songwriter, and guitarist from Hyogo Prefecture. Inspired by Julie Andrews’s performance in The Sound of Music, Uemura signed with King Records in 2005. The 36-year-old is best known for her song “Toilet no Kamisama” (“Fairy of the Bathroom” or “Goddess of the Bathroom”), an acoustic ballad about her late grandmother. The song became a #1 hit in Japan in 2010, earning Uemura the Japan Record Awards for Best Song and Best Songwriter of the Year with her album Pieces of Me. Under the name of Kana Uemura, she released nine studio albums, thirteen singles, a cover album of English-language songs, and 16 music videos. Grammy-winning producer Steve Addabbo, who helped launch the careers of Suzanne Vega and Shawn Colvin, produced her latest recording, Happiness. Bronx native Ari Hest, who received a Grammy nomination for his 2016 album Silver Skies Blue, provided backup vocals. Ka-Na moved to Brooklyn in December 2016 and has performed at Carnegie Hall, Club Bonafide, Rockwood Music Hall, and Kennedy Center in Washington, D.C.
For more information and to purchase tickets, please visit Joe’s Pub’s website or call the box office at 212-539-8500.